How HOT is Your Bellingham Neighborhood? Everyone is talking about Bellingham homes selling like hotcakes with many having multiple offers and at prices that we’d only dreamed of. So everyone knows that home values are rising like crazy… but by exactly how much in your neighborhood? I looked at a variety of Bellingham neighborhoods, from Alabama Hill to York to find out how much the average home sales price rose from 2016 to 2017. Take a look at the list below to see how quickly single-family home prices are rising (or surprisingly decreasing in some neighborhoods)… and if you are in the hottest Bellingham neighborhood! Cornwall Park with a 36% increase in the average home sales price from last year. W-O-W! 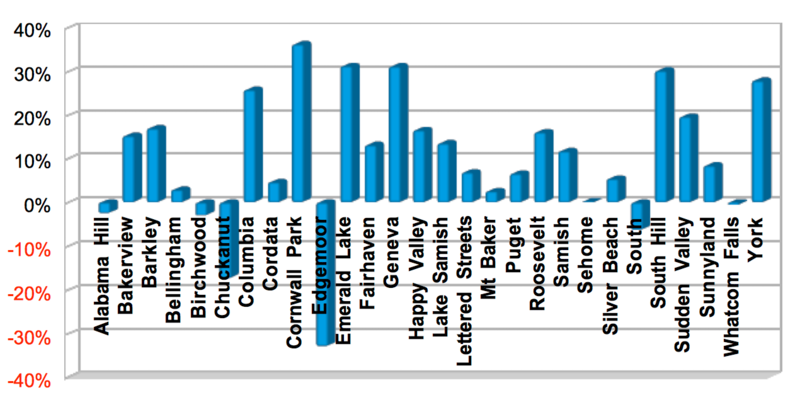 Next on the list was a tie between Emerald Lake and Geneva with a 31% increase and then South Hill with a 30% increase. York and Columbia were next. For a better understanding of the average sales price by neighborhood and the percentage increase year-over year, please see the chart below. This is based on a quarterly report. If there is an Bellingham neighborhood that we didn’t include that you would like to add in my next update, please let me know! Also, if you are curious about your home’s current value, you can get an instant value of your home with our nifty new tool. 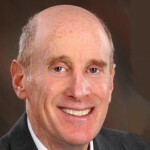 Data from the NWMLS, statistics can be decieving especially if there are small number of sales in that neighborhood. When I needed a wheelchair recently I discovered that Bellingham has a wheelchair loaning service. 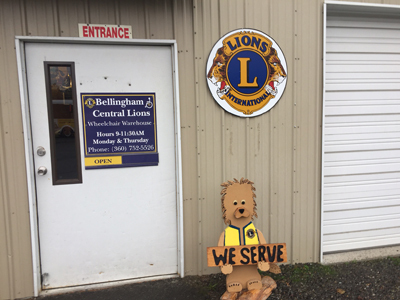 The Bellingham Wheelchair Warehouse run by the Lions Club. It’s a great service that offers loaner wheelchair’s and medical supplies the Community. Since that day I borrowed the chair I’ve been volunteering there every Thursday morning. It Is amazing how many people use the service every week. The items they loan aside from wheelchairs are walkers, crutches, canes, knee scooters, shower chairs, commodes and a variety of other medical equipment. The public can borrow the equipment for up to three months at a time. People using the equipment come for a variety of reasons from surgeries and sprains, to people in need of equipment while Medicare or their insurance approves them acquiring their own equipment, to visitors to Bellingham that couldn’t bring a wheelchair with them. Every week people come to get things for themselves and their friends and family members as well as social workers and nurses borrowing equipment for their patients. All of the equipment is donated, people bringing in all sorts of things.I even saw somebody bring in about a dozen packages of adult diapers today and somebody picked up most of them right away saying they had a relative who needed them and it would save them quite a bit of money. It’s not uncommon for 50 people to come through the door, each day either checking out or returning things. The reusable equipment is all steam cleaned before it is loaned out to the public and each time it is returned. 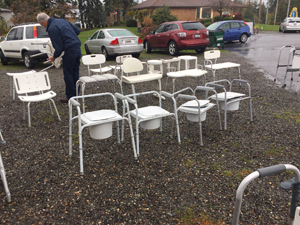 Some weeks the warehouse is packed with chairs while others there aren’t many to choose from. Besides steam cleaning equipment the guys in the shop also make repairs when they can. It is all done on a donation basis. 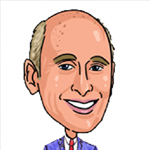 Is a really wonderful service and the public is really grateful for it. It’s always great to hear people so thankful that we are there to offer that service, and it feels good to be part of a group offering these things to those in need. 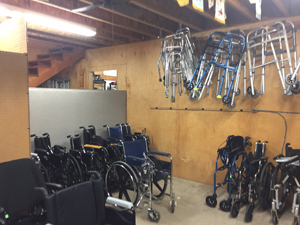 The Al Boe Wheelchair Warehouse is located at 4141 Maplewood Ave and is open Monday and Thursday from 9 to 11:30 am. You can find me there Thursday mornings. Check out this video from the city, showing the progress that is being made on the iconic Granary building. This is the first major project on the long awaited redevelopment of the Bellingham’s waterfront property obtained when GP left town about 10 years ago. The building was built up in 1928 during the boom of local chicken and egg production. Small chicken farmers banded together to form the Whatcom County Egg Producers Association and the Washington Cooperative Egg and Poultry Association in 1917. Small farmers working together allowed them to buy feed in bulk and ship their eggs and chicken to market outside of Whatcom County. 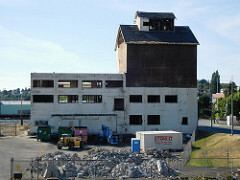 According to an article by the Whatcom County Historical Society, Whatcom County had the second-highest chicken population in the country in 1920.After the chicken co-op ceased at some point mid-century Georgia Pacific bought the building and used its lower levels as storage until the Port of Bellingham bought the site. And now we can see a new life for the building as shops and premier office space in the new waterfront.